When it comes to picking a laundry dryer, it can be hard to know what to look for and what would best suit your needs. Do you go for a washer and dryer in one, a full-sized dryer or a space-saver? Which features are important and which could you do without? Are there any with noise control so that you’re not disturbed when the dryer is in its last cycle as you’re watching your favourite TV programme in the next room? To help you make an informed decision, we’ve complied a guide to the options you have when choosing a dryer. Full-size dryers – Available in the standard sizes of ‘extra large’, ‘super’ and ‘super-plus’ but most can handle an average load of washing. You only need to start worrying about the size if you intend to regularly dry large, bulky items such as heavy quilts. Even if you have a large family, you’ll only be drying the capacity that your washing machine can take. Space-saving dryer – Ideal if you live alone or have a small space to work with. Note that the smaller opening makes it more difficult to load and unload laundry. 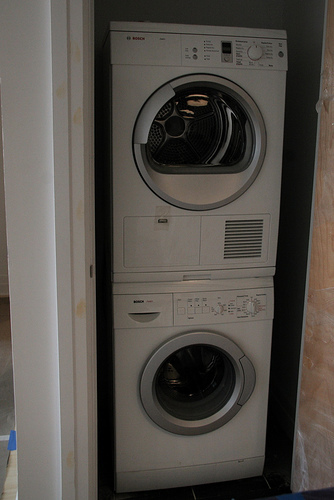 Washer and dryer combined – Another great space-saving idea, these combine a washing machine and dryer into one system. However, the drum is often smaller than a full-sized dryer. Which features improve convenience and efficiency and which could you do without? Moisture sensor – These clever metal strips fastened to the inside of the drum tell the dryer when to switch off based on the dryness of your clothes – a great energy, money and time saver and fantastic when you’re not sure which auto-dry setting to use. Wrinkle-free – This feature allows you to go out and leave the dryer on as it will continue to periodically spin the clothes until you’re ready to remove them. That way your laundry won’t be left in heap at the bottom of the drum developing stubborn wrinkles. Vent-blockage indicator – Some models now include an indicator designed to warn you when a vent is blocked, which can cause fires and at the very least decrease efficiency. However, many consumer tests have found that most indicators don’t work all the time so the safest thing to do is simply to regularly clean the lint filter. How much noise a dryer makes is an important consideration, especially if your living areas are adjacent to your laundry room. Generally, the newer models are all far quieter so buy new and from a reputable brand, such as a Fisher & Paykel dryer. We help you to choose the right laundry dryer for your household’s needs so that your life is made easier and you won’t need to buy another again for years.